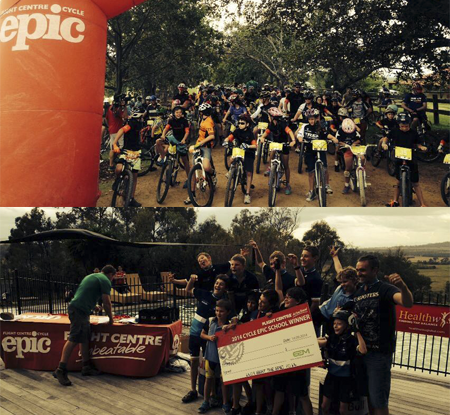 Spicers Hidden Vale became the EPI-Centre of the 2014 Flight Centre Active Travel Cycle Epic with thousands of Mountain Bikers, Sponsors, Support Crews, Family and Spectators descending upon its beautiful and scenic grounds and surrounds. The event weekend started with the all new ON Running Trail Run with the runners heading out into the trail network at 8am. 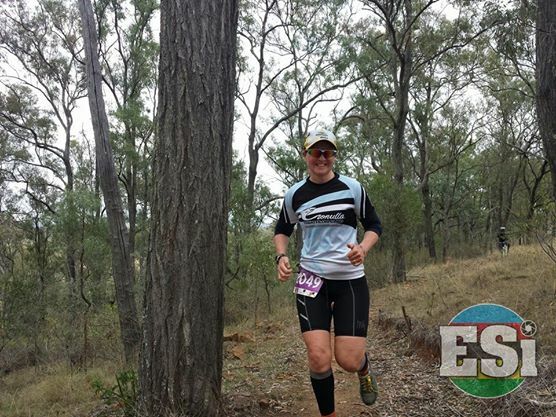 Some of those competitors, keeping some in the tank, as they were competing for the title of Epic Endurance Champion, backing their 11.5km run with the 87km Epic on the Sunday. Next up was the Family Fun Ride, with Mums, Dads, Grandparents and plenty of children enjoying the encouragement of the crowd as they completed a 4.2km lap. Some riders using this ride as a warmup for their Mini and Minor Epic to follow later in the day! For two days, kids were entertained with jumping castles, pony lead rides, rock climbing walls and giant slides – but nothing compared to the 300+ Mini and Minor competitors racing through the Hidden Vale trails, and seeing their elation as they crossed the finish line to cheers, applause, drink and lollies! The kids were out in force this year, as many schools came on board through the Epic School Fundraising initiative, with Moreton Bay Boys College taking out the title of Most Epic School Entries – receiving their full entry fees donated in full back to their school! Dean Cane posted the fastest Chaser time ever in a time of 48.54! In a field of close to 300, all Chaser racers enjoyed perfect, dry track conditions. The entertainment and excitement continued on into the night, with the boys competing in the Framed BMX Night Jam – Pro BMX Dirt + Big Air Comp. As the rain fell, tents were tested for their storm and water ratings…and although it didn’t last for long, thoughts went straight to the track conditions for the big races starting just those few hours away. A stunning morning greeted those early morning risers with the smell of fresh coffee and bacon and egg rolls…with that added aroma of freshly dampened grass for the storm the night before. The registration room was a hive of activity, with the registration team getting over 800 on day collection packs out to riders who were kitted up and ready to race! With 1000 plus riders assembled under the starting arch, the ride started off with a steady and consistent stream of riders each clocking their start time as they went across the start timing mats. Riders were met with newly installed water-bars at the first descent, with every one of the Sunday riders making it through unscathed… until the first wave hit the valley below turning the wet black soil into a sticky paste making for for an additionally challenging first 40km! One of the great things about the Epic is the personal experiences and stories that come back to Race HQ once riders return, rest and refuel…some of these recounts included event crew radio calls of ‘dogs on track’, ‘dog captured’, ‘dog has escaped’, ‘dog has been captured again’, ‘there is a bull on the track’, ‘there is a burning tree in the paddock’, as well as a number of mechanicals and DNFs reported – more than enough entertainment to keep the on track event crew busy throughout the day! Of course, an event like this can not take place without the huge support and help from our Sponsors, Supporters and Volunteers! Many thanks to Flight Centre Active Travel, Spicers Retreats, Hotels and Lodges – Particularly to Spicers Hidden Vale -, Healthwise, ON Running, Merida, 99 Bikes, Ride Mechanic, Infinit Nutrition, Compressport, Ground Effect, All Clear, Next Byte, Yakima and Cyclinic. Thanks to all our helpers, supporters and volunteers – to all those who put in months of planning, preparing, baking, organising, phone calls and networking! With just over 50 weeks to get your training in for the 2015 Flight Centre Active travel Cycle Epic, we look forward to seeing you all and many more for the 13th annual Cycle Epic on the 12th-13th September, 2015 (entries open March, 2015)! !